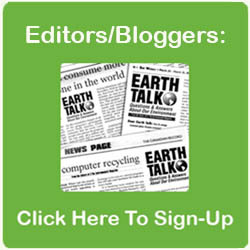 Dear EarthTalk: What’s going on with Earth Day this year and how can I get involved? – Christine B., Boston, MA This coming April 22 will mark the 44th annual celebration of Earth Day, and the focus this year will be green cities. “As the world’s population migrates to cities, and as the bleak reality of climate change becomes increasingly clear, the need to create sustainable communities is more important than ever,” reports Earth Day Network, the Seattle-based non-profit that helps coordinate Earth Day celebrations and serves as a clearinghouse for related information and resources. The group hopes to galvanize the support of more than a billion people across 192 countries this Earth Day for increasing the sustainability and reducing the carbon footprints of urban areas everywhere. By focusing on buildings, energy and transportation issues in cities this year, Earth Day Network hopes to raise awareness about the importance of making improvements in efficiency, investments in renewable technology and regulation reform in the urban areas where half the world’s population lives today. By 2050, three quarters of us will live in cities, making it more important than ever to adapt and adopt policies that take into account how to support larger numbers of people with less environmental impact. Earth Day Network has already mobilized a network of partners on the ground in strategically placed cities and towns around the world to organize grassroots efforts to improve local codes, ordinances and policies that will help cities become models for sustainability, but participation of the wider public is crucial to making the Green Cities campaign a success. The Green Cities section of Earth Day Network’s website features a series of in-depth tool kits designed to educate the public about key elements of the campaign and serves as the locus of organizing around Earth Day 2014. By making such resources freely available, Earth Day Network hopes to spur individuals to take civic action by signing petitions, sending letters to policymakers and organizing more events. Some of the ways to get involved and raise awareness in your local community about Earth Day itself and the need to green our cities include: hosting a talk for co-workers or community members on the topic of local sustainability initiatives; starting a farmers’ market; organizing a day of tree planting, park or beach clean-up, or an eco-fair; and leading a recycling drive to collect as much metal, plastic and glass as possible. Schools can register with Earth Day Network and get access to many student-friendly resources, including an interactive Ecological Footprint Quiz and environmentally-themed lesson plans tailored to the needs of different grade levels from kindergarten through high school. College students can work with dining services to start a composting program or switch over to reusable plates and flatware or start a competition between classes or residence halls to reduce waste and electricity use. Those looking to initiate just participate in an Earth Day event need look no further than Earth Day Network’s website, where a comprehensive database of Earth Day events around the world is updated daily. Even better, keep in mind that every day is Earth Day and the planet—and generations to come—will benefit from every positive action you take. CONTACTS: Earth Day Network, www.earthday.org.